Albert Heim was a professor for geology with international reputation at ETH Zurich and the University of Zurich, Switzerland. He created some good terrain models displaying geomorphologically typical landscapes for use in schools, but more important was his role as a promoter of terrain modelling. He encouraged his two students Xaver Imfeld (18531909) and Fridolin Becker (18541922) to create terrain models. Beside these two, Simon Simon (18571927) belonged to this “school of Zurich”. 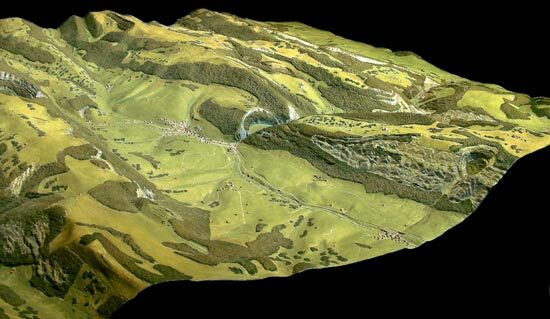 They based their work on the “Siegfriedkarte”, the first exact map of Switzerland with contour lines, at the scale of 1:25,000 and 1:50,000. After Heim’s instructions, Carl Meili (18711919) created the famous relief of the Säntis . Heim proposed rules of colouring terrain models, after undertaking several studies together with Carl Meili. He also took part in four balloon flights, where he became aware of the great influence of the atmosphere on the colours of a landscape viewed from a distant bird’s eye view . Imhof, Eduard. Bildhauer der Berge. 1981. S.128. Heim, Albert. Relief des Säntis in 1/5000. 1904. S.3.